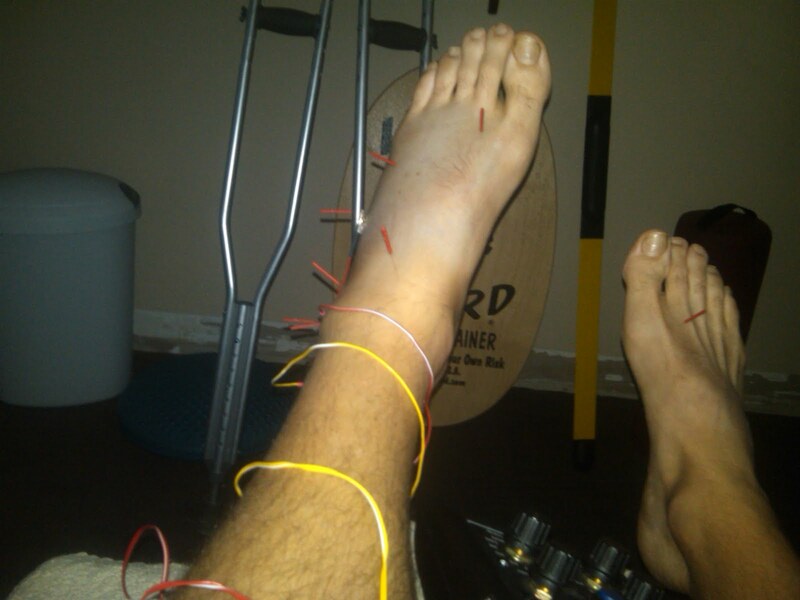 Chiropractic Sports Institutes TIDBITS: Grade 3 Ankle Rehab continues! Ever wonder how the pros bounce back so quick and the "common man" doesn't? Are they superheros? Do they have something the average person doesn't have? Yes, you could argue they have the resources and financial means to make things happen, but is that all? I hear so many times "they just get a shot and they are good to go", Really? NO! There is another world out there with the emphasis on tissue recovery, injury rehab and wound management. The difference between the pro and the "common man" is the pro thinks "I have to get back tomorrow to make a living" and they are willing to put in the work. They also are surrounded by professionals whose job is to get them back. They view their body as the biggest and most precious commodity they have and will do what it takes to get it back to working order. They don't let insurance dictate their health, they know they will lose more money by being out then they will spend on getting better. This is the line that most "common people" don't cross. They don't put together a team to get well and do what it takes to do so. This is what I have done and so far I am already weeks ahead of schedule! Yesterday I decided I needed to get back to work, more for mental than physical. I needed to be in an environment that invoked positive attitude and healing. I started the day with my nutritional cocktail of Proteolytic Enzymes (zymain), Omega 3, Ligaplex and joint support. http://bit.ly/healingsupplements This cocktail is so important. Again, you would not build a house or repair a fence without the necessary tools and supplies. When you are injured you need the necessary chemicals at hand to make the repairs. If you don't supplement your diet where is the body going to get what it needs? From your diet! If you diet doesn't have it the body will find them but this takes time and time is not what you have. Let me tell you, I am taking these supplements 4 times a day and my urine is clear. What does that tell you? My body is using everything I am giving it. Again, have the biochemicals on hand so your body can take what it needs! I grab a quick bite of protein and veggies and head to Dr. Shari Phillips, Acupuncturist, to get needled up. 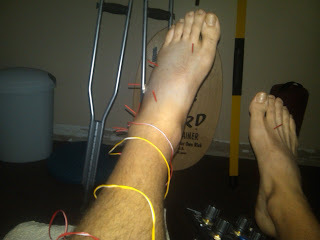 Acupuncture is so important to keep circulation moving through the injury. The goal this first week is to flush out "stagnant blood" and bring in new blood that is rich in the biochemistry and oxygen. By using Acupuncture and Stim you can target the area you want to work on and enhance the circulation without compromising the integrity of the joint. A special thanks goes to my team. Without them this would not be possible. Dr. Shari Phillips, who is an extrodonary Acupuncturist with advanced knowledge in Orthopedicts and Nutrition. She can be reached at info@shariphillipsacupuncture.com. To My Doctor at CSI, Dr. Amir Mahmud, for his skill as a Sports Chiropractor, getting adjusted is key to biomechanical as well as Neurological well being. Dr. Grace Hameister, the "Laser Guru" This Doctor is the guru when it comes to Lasers and tissue healing. She is also so well versed in Hyperbaric Chambers and combo therapy. She has helped many Pro Athletes as well as trained some o f the Top Athletic Doctors in the field. I am so blessed she is my friend and is helping out. She can be reached at docnextdoor@yahoo.com. Rob Bolton and Billy Miller for allowing me to use their Hyperbaric Chamber. If you need one call on "The ELite Factory" in Westlake, Awesome place to train and heal.